Interactive graphics helps readers to identify and understand trends and patterns through charts, graphs and maps. Here are two tools that are suitable for beginners. Datawrapper is a free online tool that enables you to create interactive charts and maps. It has been used by a variety of newsrooms such as Huffington Post, The Guardian and Australian Broadcasting Corporation. Seen here is an example of a scatter plot, found on Datawrapper’s River. On the River, you can exchange relevant data, charts and maps. You can also reuse any of the charts, and customise it to make it your own. Create a chart in 3 easy steps! 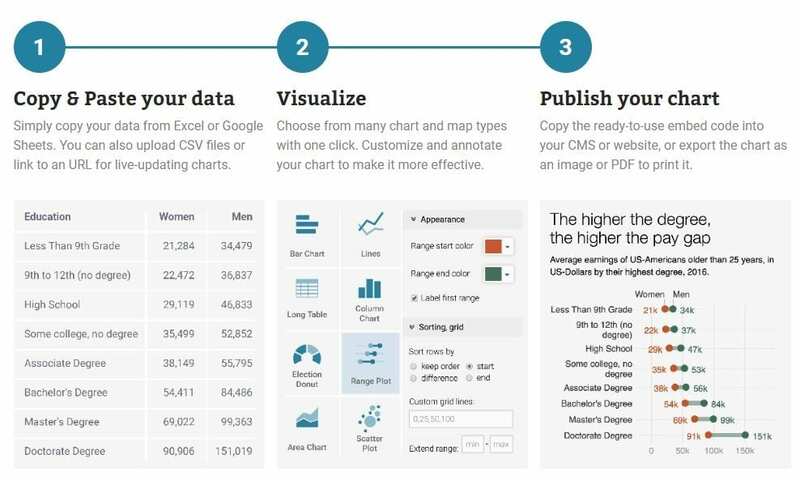 Create charts, infographics, maps and even reports using Infogram’s intuitive drag-and-drop editor. Infogram offers a free basic plan which allows you to create up to 10 projects, with over 37 interactive chart types to choose from. Here, advocates for children’s rights and well-being Eurochild, used Infogram’s map option to visualise child poverty rates in Europe. Hovering over the individual countries will reveal the exact percentage of children at risk, and Eurochild’s recommendations on tackling the issue. The bar below the map allows readers to filter the map by the different percentage ranges. Want to create a map similar to the example above? Watch this video.